The City of London is a city within London. It constituted most of London from its settlement by the Romans in the 1st century AD to the Middle Ages, but the conurbation has since grown far beyond the City’s borders. The City is now only a tiny part of the metropolis of Greater London, though it remains a notable part of central London. It holds city status in its own right and is also a separate ceremonial county. It is widely referred to simply as the City (often written as just “City” and differentiated from the phrase “the city of London” by capitalising “City”) and is also colloquially known as the Square Mile, as it is 1.12 sq mi (2.90 km2), i.e., just over 1 sq mi, in area. Both of these terms are also often used as metonyms for the United Kingdom’s trading and financial services industries, which continue a notable history of being largely based in the City. The name “London” is now ordinarily used for a far wider area than just the City. “London” usually denotes the London region, which is also known as the Greater London administrative area, comprising 32 boroughs (including the City of Westminster), in addition to the City of London itself. This wider usage of “London” is documented as far back as the 16th century. The local authority for the City, namely the City of London Corporation, is unique in the UK and has some unusual responsibilities for a local council, such as being the police authority. It is also unusual in having responsibilities and ownerships beyond its boundaries. The Corporation is headed by the Lord Mayor of the City of London, an office separate from (and much older than) the Mayor of London. The current Lord Mayor is Fiona Woolf. The City is a major business and financial centre. Throughout the 19th century, the City was perhaps the world’s primary business centre, and it continues to be a major meeting point for businesses. 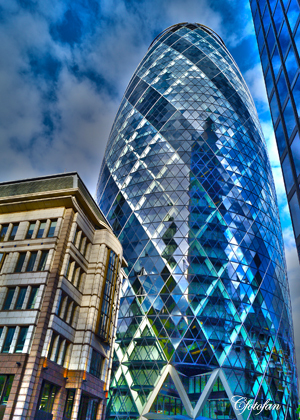 London came top in the Worldwide Centres of Commerce Index, published in 2008. The insurance industry is focused around the eastern side of the City. A secondary financial district exists outside of the City, at Canary Wharf, 2.5 miles (4.0 km) to the east. The City has a resident population of about 7,000 (2011) but over 300,000 people commute to and work there, mainly in the financial services sector. The legal profession forms a major component of the northern and western sides of the City, especially in the Temple and Chancery Lane areas where the Inns of Court are located, of which two—Inner Temple and Middle Temple—fall within the City of London boundary. La Ciudad de Londres (en inglés City of London y, más informalmente, the City o Square Mile, debido a que su superficie es de alrededor de 1 milla cuadrada o 2,6 kilómetros cuadrados) es una pequeña área en el Gran Londres. La conurbación moderna de Londres se desarrolló alrededor de la City y la cercana ciudad de Westminster, la cual es el centro del gobierno real. La city de Londres es uno de los más importantes distritos financieros de toda Europa, junto con La Défense, en París. En la época medieval la City constituía la extensión total de Londres, pero este último término es actualmente utilizado para referirse a una conurbación mucho más grande que contiene la City y los 32 London boroughs (la City no es un distrito de Londres, ya que tiene un estatus especial), entre los que se encuentra Westminster. La City continúa siendo parte del centro de Londres, pero exceptuando los servicios financieros, la mayoría de las funciones metropolitanas londinenses están concentradas en el West End. La población residencial de la City no supera los 9000 habitantes, pero el número de personas que trabajan allí es de alrededor de 320 000. This entry was posted in captures, culture, fotografías, fotos, gallery, Images, imágenes, photos, pictures, travel and tourism, turismo and tagged distrito financiero, financial district, la City, London, Londres, the City. Bookmark the permalink.